Nature Foundation (India) is a Non Governmental Organization in tune with nature and dedicated towards nature conservation. 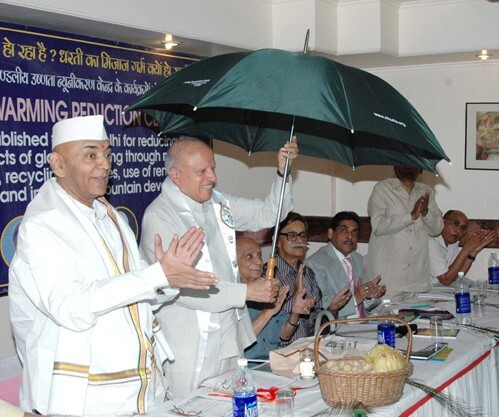 The foundation recently invited the eminent Dr. M. S. Swaminathan among others, to launch a Green Umbrella project at the Russian Cultural Center in Delhi. With “Green” standing for clean and green environment and “Umbrella” symbolizing protection, conservation and coming together of like minded individuals, the programme will be executed with the co-operation and blessings of Sh. M.L. Dewan and the Global Warming Reduction Centre. The mindless exploitation of nature and natural resources has put the present and the future generations at considerable ecological disadvantage, risk and shock. The future generation is the MAJOR STAKEHOLDER of the environmental sweepstakes. thus, the aim of this all encompassing project is to catch them young. As part of the project, Nature Foundation (India) will be holding a series of workshops in various schools. These will be followed by poster making and slogan writing contests and an increases thinking and action on water conservation. The project will work simultaneously at three levels. The first: informing, equipping children with the knowledge of the planet, the ecosystem and the environment and also the need to conserve it. The second: getting them to take action and inspire, pursue conservation activities around them. And the third to enhance creative expression and involve them in becoming a part of the movement for a change. The target, by the end of first year, is to baptize the young generation in becoming agents of environment conservation. It is hoped that the army of “Green-Literates”, thus created would be able to face the challenges of climate change in an able manner because, FOREWARNED IS FOREARMED. The “Green Umbrella” will be given to all participating schools symbolizing that the students of this school are better equipped to face the challenges of climate change etc. its a fabulous project. the idea is also very creative. lets support. Good effort Please if need any help let us know we (our group members) can join hands with you. good very good hai ji .our team with u always. The activity is vary creative,sir, can i take part in yor project ?.oterwise give me work for our region as apart of your project. Thank you for this great report. It was very helpful to me and to the one who read this page. You truly is a genius writer! While browsing for sites relevant to website hosting and specifically comparison hosting linux plan web, your website showed up. Have you ever thought about including somewhat bit additional than just your ideas? I imply, what you say is critical and every little thing. Even so its obtained no punch, no pop! Maybe in case you added a pic or two, a video? You could possibly have such a additional very helpful weblog for people who let men and women SEE what youre speaking about as a substitute of just studying it. Anyway, in my language, there usually are not considerably great supply like this.